The Radionic Ships of the Heavenly Host | Radionic Fall Holes. Radionic Fields will sometimes worm hole their way down through the lowest cloud cover befuddling Scientists and amazing everyone else. A Mother or Father Ship will sometimes need to come down so low and hold steady for communication purposes for so long, that they will break through a low prevailing cloud cover and ionnize themselves. The pressure of their magnetic Field will push away the cloud moisture around them, producing a hole around the shape of the ship. Most of the time they will appear variously as long or short cigar shaped condensated clouds within the hole. Mother Ships will usually not have been stationary long enough to set up long tubes and Father Ships will usually not have been stationary long enough to set up long radial fringes. Producing respectively short tendrils and frilly eyelash ionnizations instead. 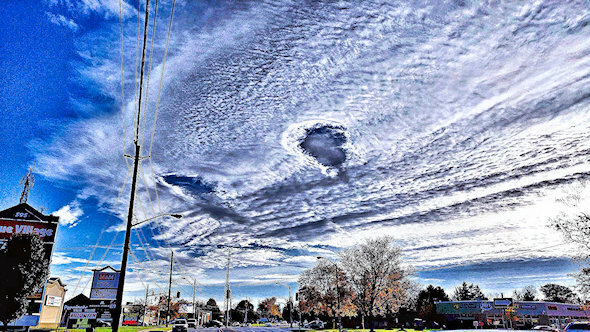 Such occurrences are called Fall Holes, taken from the Scientific interpretation called, 'Fall Streak Holes' or Hole Punch Clouds' based on the previously mentioned idea that a patch of water vapor above the cloud has cooled below the freezing point but has not yet turned to ice crystals. A passing plane or other event will shock the vapour into suddenly turning to ice and the heavier weight causes them to fall though or punch through the cloud layer below. Down it comes like a heavy weight on wet tissue paper, punching a visible hole through. The shock of an intense magnetic field around a Mother Ship or Father Ship which has stopped in, can do it just as well. The difference is that you will see Mother and/or Father Ship Radionics at the hole at the same time. Most Fall Streak Holes are Radionic as there is no evidence of a plane or something similar anywhere near it. But when you don't know about Radionic Ships, how else are you going to explain it. Like Chemtrails, it is easy to be confused unless you know what you are looking for. Radionic Fall Holes have Radionic effects present. The magnetic eyelash ionnizations around a Father Ship is the giveaway, tendrils or tubes are the usual giveaway around a Mother Ship. Figure 3 in Starrgram 6 is a Father Ship Fall Hole event. Looking very similar, the following frilly cigar shaped Father Ship Fall Hole Radionic Cloud below found on the Internet, was photographed over Phillip Island off the coast of Victoria, Australia near Melbourne, on November 2, 2014. Notice that the frilly eyelash magnetic radiations are symmetrically away from the Ship including around the ends. This shows clearly that the Ship is Radionic. Also, notice that the pressure from the frills is holding the hole open. For convenience, they will be henceforth be referred to simply as Fall Holes to differentiate them from actual Fall Streak Holes. Victoria Australia was in the news again. In June of 2018, a large black triangular Ship was observed hanging overheard for a couple of hours. Your Military is known to have large triangular ships. But why in Victoria, good question still unanswered. Figure 1 - Blimey, that looks just like a Didgeridoo. As the following Figure from the Internet also shows, Fall Holes like to catch the noonday Sun. It's not that hard. All you need is a Fall Hole, a Radionic Ship and a little bit of sunlight at the right angle. Figure 2 - Color me Kodachrome. The following Internet image is of a Father Ship Fall Hole sitting serenely in a partially formed Negative pole Field, with secondary ionnics all over the place. Figure 3 - I'm a Scientific Fall Streak Hole I tell you. Believe what you are told and not what your lying eyes tell you. The following image of a Father Ship Fall Hole off the Internet is not in an Anchor Ship Field but it is sure letting it all hang out, or in this case up. The fact that it is in a more normal cloud layer also belies the fact that Radionic Fall holes are a result of a special type of ice forming cloud conditions. Add in the Mobiles scattered around, and it's a slam dunk. In the same kind of way, the Following Father Ship Fall hole from the Internet kind of looks like somebody coming out to grab you. More likely it's putting its hands out to keep from falling all the way through. Actually, it's a nice illusion. The lower arm is just a Sun shadow of the upper. The West Jet cruising by heading left underneath puts the size in perspective. These are not your average corn flake box size phenomenon. Figure 5 - And now Ladies and Gentlemen, on your upper right, something. Depending on the camera angle and shadows, the effects can sometimes be pretty wild, like the Fall Hole effect over Australia in the Internet photo below. Don't ask, looks like a Stag beetle getting ready to grab a chunk of Cloud for a nest. Also notice the faint Radionic presence up in behind. Figure 6 - My Uncle Dung would have a field day up here. On the other hand, word is out that somebody just came up with a new type of cloaking device for hiding their Cruise Missiles. As the Figure from the Internet below clearly shows, the device resets the missile to look just like a Radionic Father Ship Fall Hole whenever the snooping feelers of radar come anywhere by. The theory behind it is that since no one is looking for Radionic Fall Holes, nobody will see it. A better idea would be to re-direct the missiles straight into the Ocean. Then nobody would ever need fear them either. Figure 7 - Something's fishy here Man, me and my thirty five buddies keep ending up in the drink. The following Father Ship Fall Hole image from the Mont Tremblant ski resort in Quebec on January 8, 2016, is included not because it is anything spectacular, but it was taken by a known live camera by the known live friend of the cause from Hunstville, Ontario, at known live location on a known live date. Not that the other's aren't spectacular, it's just that here there is no mystery about who it was, where it was, why it was and when it was. Figure 8 - Ain't that quaint, a real live early model Ford. The nag's out back. Most Fall Hole Ships are short cigar shaped like the ones above. The following Internet Fall Hole image has a fairly long Mother Ship running its whole length. This one also has a well defined Mother Ship Radionic Radial influence showing in the cloud cover around it. Also cementing the case for Fall Hole Radionics versus passing jets. There are other Mother Ships in the area, particularly a small one in the middle left. The Radials outside a Fall Hole often tell more about the kind of Ship involved than the Radials inside. Likewise, the fairly long Father Ship reflection below off the Internet sits in a Fall hole which has been distorted somewhat by the wind. It also has frilly Radials at the upper right and sits in a not so obvious Negative pole Radionic Field, making it a doubly tough case for ice crystals. Figure 10 - Do you mind running that by me again, the part where it blows the ice crystal theory out of the water. The next Father Ship fall Hole from the Internet is a bit easier to make out. No doubt it's a Fall Hole this time. Mother and Father Ships together in the same Fall Hole are also very common. A Mother/Father Ship Fall Hole over Florida USA, found on the Internet, sits up there calmly doing something. Not much to say except the Mother Ship is the lower and the Father Ship the upper. Figure 12 - Howard Johnson's first big spread. Also found on the Internet, a Father Ship and Mother Ship lie parallel to each other in the same Fall Hole over Indian River, Florida, date unknown. Again, the Mother Ship is the larger the Father Ship the smaller. It's hard to vision a passing jet causing this much ruckus. Likewise here's another Mother/Father Ship pair below from the Internet, this time with Father Ship inside a Fall Hole and Mother Ship outside. As previously explained in Figure 18 in Starrgram 7, it shows Radionic stuff both ways, frillies inside the hole with the Father Ship you see visible in the middle, and tubes outside from the Mother Ship you see only by it's outline at the bottom right. Figure 14 - Now you see me now you don't. The following photograph also off the Internet also is completely unambiguous. It is straight out of the Fall Hole category. This one has everything. A perfectly formed Mother Ship Radionic Field sits to the left beside a perfectly formed Father Ship Field in the center. Additional long and short Fall Hole activities exist at the lower left and across the lower right. The rosy touch doesn't hurt either. Must have been a major NPlus static clearing event going on wherever it was. Figure 15 - Busy is as busy gets. Another similar tricky Fall Hole event is shown below, originally presented as Figure 17 also in Starrgram 7. The Fall Hole, photographed in Paradise, California has a Mother Ship Field spreading out from the Mother Ship sitting in the left half of the hole. With Father Ship frillies spreading out from a Father Ship sitting behind the grey patch in the right half. Plus another clutch of Father Ship stuff just above the low center trees. Plus another nice looking Mother/Father Ship pair running upwards at the center right. Figure 16 - Must have been a Super Sonic Jet to do all this. The following Figure, also from the Internet belies the idea that ice crystals have fallen through, because it has a Mother Ship and two side by side Father Ships collected together shoving into the cloud and not coming through out of it. The Mother Ship sits just to the left of the right vertical edge of right side Cloud layer. The first Father Ship is to the very far left of that, with some interesting interacting Radionic activity going on between them. The second Father Ship is at the bottom right pushing into the cloud like a plow. And look at how much of everything isn't involved with clouds at all. Figure 17 - We plow sidewalks for twenty bucks an hour. No double Fall Hole presentation would be complete without King Tutankhamen's nemesis from Figure 19 in Starrgram 7. As mentioned before in Starrgram 7, she's on the left and he's on the right. Figure 18 - So it's settled then, this is the headdress we're going for. Different sized Ships in adjacent Fall Holes are also common. The following Internet photo has a very large Mother Ship Fall Hole sitting above a much smaller Father Ship Hole. All inside a field of smaller Mother Ship Fall Holes across the lower center. Also, all sitting in a nice quiet Negative pole Radionic Cloud. Is the fleet in or what. Is this a family gathering for Thanksgiving. At any rate here's a month's worth of examples all at the same time. Figure 19 - Mirror mirror on the wall, when is a big hole part of a fall. The Figure below from the Internet says it even better. It's not hard to tell that the Father Ship is the bigger one and Mother Ship just above the hills the smaller. Figure 20 - No sign of ice crystals out here, are you sure you know what you are talking about. In a slightly different vein, here is another scene from Spielberg shown below. According to all accounts, anytime light from above shines on someone down below you know you should be on your best behavior. Or in some supposed circles somebody is getting abducted big time. Or in even trendier circles somebody is vying for an Oscar. In the old days, whenever light shone down everyone used to leap to their feet shouting 'Halleluiah'. Nowadays they say, 'Hey, how ya doing, what took you so long'. Actually, this is a legitimate Fall Streak Hole occurrence with fun from the Sun added in. A faint Mother Ship and Father Ship pair looking a bit like Figure 26 of Starrgram 7 lying together along the bottom left likely triggered it. As an aside, if you find yourself in a dream state lying on a hospital bed gurney, with electronic instruments all around and wires and tubes plugging into from all directions plus Beings standing around talking in quiet whispers about you, it doesn't necessarily mean you've been abducted. It could also mean that you are being forewarned about winding up in a Hospital intensive care facility because of some calamity. It actually happened to someone known to this word smither, who actually thought they had been abducted when the dream sequence occurred as a forewarning exactly two months before the actual event. The dream sequence seems very real, and was absolutely identical to the actual Intensive Care Hospital room event which eventually occurred. Which was absolutely identical to the countless abduction scenarios found all over the Internet. Even to the point of being sawed up when a heart or similar operation is being performed. Figure 21 - God said, 'Let there be light', and instantly millions of people around the World lost twenty pounds. On the other hand, as the Figure below from the Internet shows, mid size Sylphs are also very good at making Fall Holes of their own by the same disturbance of magnetic shock. The Internet shows Sylph photographs in Fall Hole settings more often than they would be otherwise be seen for being more dramatic to the eye. Sylphs are otherwise not particularly outstanding unless like the sailing ship Figures near the top of Starrgram 10. Then who's to notice. With a Fall Hole involved they at least have something interesting enough to get noticed about, hence photographed and put up on the Internet. Figure 22 - Pardon me, do you look familiar. The Sylph equivalent to a Mother and Father Ship in the same Fall Hole, is two Sylphs together in the same Fall Hole. The following double whammy Sylph Fall Hole off the Internet occurred in Chesapeake, Virginia at an unknown date. Nothing quite like two for the price of one. Notice two heads, two sets of wings, two tails. Ergo, two Sylphs. Figure 23 - I'm schizophrenic, you can count on me. Sylphs really do like to make Fall Holes. The following image from the Internet features a Sylph cavorting around in a Fall Hole making sure the whole world knows. Figure 24 - Hi ya folks, I like to party. Do you like to party. We all like to party. And here's a Sylph trying real hard to fly out of the nest. What's really interesting are the dozens upon dozens of Mobile Radionic Ships all over the place trying to help. Figure 25 - Gimme a break here, I'm stuck. The next three photographs are in the fun rather than informative category. They are specifically three of the same event over Sacramento, California where a picture says a lot more than a thousand words. The three were found here and there on the Internet, taken at different times at different search locations. A convenient time sequence exists via the progress of the sun from the left towards the center in the progressive photos. All three are of a Sylph in a Fall Hole. The fun part is that all three are highlighted by the sun in progressively three different areas. In the first photo the highlight is on the left, i.e., on the Sylph's right wing. In the second photo, a sharp hit from the Sun puts a letter in the Sylph's beak. Maybe this is from the next Harry Potter movie and it's someone's Owl thing bringing their application to Hogwarts. Notice that the sun has started moving in from the left. Figure 27 - Special Delivery for 'Occupant' from 'Publishers Warehouse', please sign here. The third image now features the Sun highlight on the right side, i.e., the Sylph's left wing. The two Mobile Scout Ship eye blips which have always been there, now makes it look like a Character from Sesame Street. The sun is almost at the Fall Hole. Similarly, the up turned tail on the following Figure of a Fall hole Sylph from the Internet, turned well towards the camera almost makes it look like a Space Shuttle landing. Incredibly, a Father Ship Radionic Field sits perfectly centered way up back in the middle of the Hole. Figure 29 - Buckle up everybody, highway coming up. Likewise, the next Figure below, also from the Internet is of a Sylph likewise dive bombing out of the Fall Hole instead of staying put across. Anybody who thinks ice crystals can do this needs to back off the sauce a bit. Looks a like a Platypus. It's even got the right color. Maybe they're related, after all, aren't Platypuses also considered some kind of off the wall character. Figure 30 - How I got to be red molasses brown on a dark blue background is anybody's guess. Like Figure 23 above, the following image from the Internet has two Sylphs for the price of one heading into the drink for a swim together. You might also notice they are more than a wee tad away from the Fall Hole they supposedly just fell through according to the Fall Streak Hole Punch theory. Also not to mention the fact they are not even close to falling straight down. Some significant sailing has just occurred here and as you can probably imagine, ice crystals don't sail that well. Likewise, this is not the middle of winter. Ice crystals have a tendency to melt real fast in warm air and these guys are a long way out of the hanger. Also, for fun check out the two goldfish in the Choy pond below. Since when do spurious ice crystals cast perfect solid seeming shadows. Figure 31 - Who are those two clowns down there, they do look familiar. The following is included in this Revelationnum for two reasons. First, not because it is a stellar example of some Radionic stuff inside a Fall Hole, but because the two are Fall Streak Holes inside a Radionnic Field. If you look carefully at the bottom center of Figure 3 of Starrgram 9, you will see the holes sitting there bold and brave with nothing in them yet. Second, the photo is included because it was taken in Brantford and how many of those have you seen. This gives credence to the possibility that all Fall Streak Hole presences are caused by some kind of Radionic Ship activity, visible or not. As the factors could bear, this scary good photograph and a few others in this Revelationnum were taken with an LG5 cell phone camera. It had came out with a very high resolution camera which made all the other cell phone cameras look first year. Then for reason completely unknown, the LG6 came out with the original first year type camera. If you have a LG5 cell phone and like to take pictures, don't throw it way. It might very well become a part of revered history. Figure 32 - Ships inside a Fall Hole, Fall Streak Holes inside a field, it's all the same difference to us and we are all together. On the other hand, sometimes a Father Ship and little Brother Ships will be present at the same time just outside of somebody else's field. The following two Fall Holes were photographed by another Brantford friend of the cause over the Six Nations Indian Reserve again just South East of Brantford on June 14 of 2016. As you can see the two are sitting beside a very large rather diffuse Mother Ship Field but not in it. The photo was taken through the car window so bears some smudges in the upper right. Figure 33 - No sign of ice crystals out here, must be those high frequency Spiritual vibes you keep hearing about out here. On the 14th of September, 2018, a sea of Fall Holes suddenly exploded over a wide region of the Bay area around San Francisco. Everybody was between agape and agog. Every Newspaper and TV Station in the area did a big story, including dozens of photographs sent in from all over. The holes were explained away of course as Punch Holes, caused of course by a passing plane shocking hyper cold water crystals into heavy ice, explained away carefully of course by a Weatherman who had just been handed a script. .
What nobody noticed of course was the real cause sitting quietly to the side, as one of the many example on the website for the San Francisco and area ABC 7 News. Namely, a huge Mother Ship sitting at one edge of the area. Two smaller Mother Ships sit at the middle left. A direct Field interaction between the small Father Ship in the visible Fall Hole at the lower right and the big Mother Ship can even be seen. Figure 34 - Cause always confirms itself in effect. A variant below shows a partial Fall Hole with the better part of a croissant shaped Mother Field sporting both horizontal ribbing and short Radial lines somewhat similar to the Mother Ship side of Figure 18 above. The croissant shape is fitting as it was photographed in Saguenay, Quebec on May25, 2018. Saguenay is a small civilized area of about two hundred and fifty thousand people in the middle of nowhere at the North East side of Quebec Province. It is about a hundred kilometers inland up the Saguenay River running due West from the St. Laurence River, which empties into the ocean not much farther past. It's also the last of any significant civilization of any kind in Canada on the Eastern side. Going North from Saguenay are only the standard token Canadian North type occasional small communities, accessible some of them only by Plane. Going East up the St. Laurent River sees only a couple of small towns, then Labrador. As everyone knows Labrador has nothing it but an Air Force base at Goose Bay and a big hydro electric project at Churchill Falls. After that, you can put the entire population in a small Hat. What's most noticeable about Saguenay/Chicoutimi is that nobody speaks English, not even a single word except for a few people who moved there from other parts of Quebec, like Montreal where at least some English is spoken. It's also one of the most scenic places you'll find on the Planet. Likening it to Shangri-La' for both beauty and isolation would not be that far off. 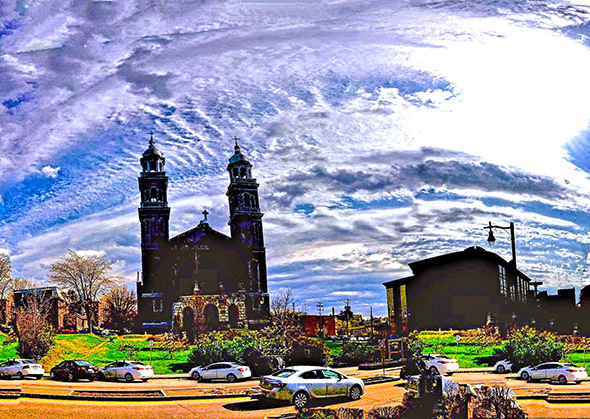 for sure, the Catholics sure know how to grab a landscape. What is even more interesting is that Fall Hole like characters can sit out in the open, no hole, proving once again that ice crystals don't have everything to do with it. You can obviously only see an actual Fall Streak Hole when there is also a low cloud cover present. Here is an interesting Figure from the Internet where a short Father Ship Fall Hole character sits right in the center of the photograph with no Fall Hole type activity anywhere around. Also sitting right beside it and tacked onto it at right angles to the left is a nice long Mother Ship Radionic Field. Figure 36 - Holy heck Batman, where the heck did the Fall Hole go. As previously mentioned, the particular Radionic Field observed in any given area at any given time will depend entirely upon the type of Ship involved, the amount and kind of water vapour present, and the Magnetic field of the Earth in the particular area. Also, this abundance of Radionic clouds off the Internet and similar in earlier Starrgrams from everywhere on the Planet whose the dates and locations are completely unknown, make patently clear the point about Radionic Ships being all over the place all of the time. It is not surprising that such a preponderance of photographs exists on the Internet. People see the clouds, know that they are not normal without having any idea about what they actually are. Click goes the shutter and up on the Internet it goes. What is also a certainty is that the number of observations and photographs will be increasing rapidly in the very near future as the work of redeeming Mankind back to the fifth dimension has been stepped up in earnest. Likewise obviously, the same for any Radionic Field you might see overhead and manage to photograph. The more the better since every example goes further to prove the principle and the more the merrier.